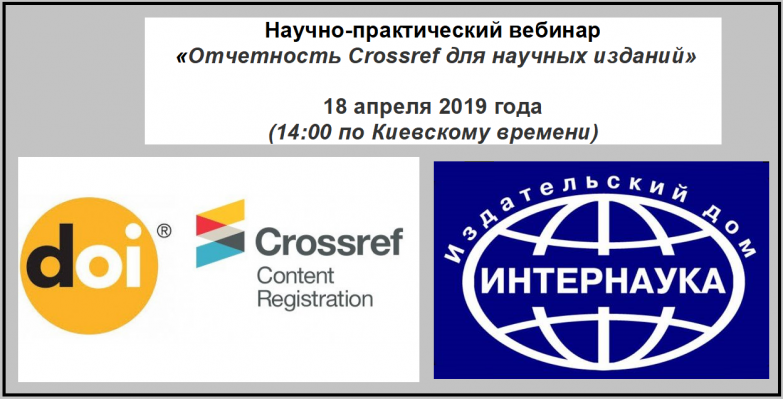 The Publishing house "Internauka" (Kiev, Ukraine) - specializes in the production of scientific journals, monographs and scientific manuals, organizes international scientific conferences. Journals of the Publishing House "Internauka" are included in the leading scientometric base, distributed by the world's major libraries and universities. For more information about the house is presented in the section "About Us" (link). The publishing house "Internauka" is an official partner (Sponsoring Member) of the PILA in Europe and provides registration services for publishing houses (publications, universities, scientific organizations) in Crossref agency with the purpose of assigning the scientific materials to the digital identifier DOI. More detailed information about the cooperation is presented in the section "Assignment of DOI"
International scientific journal "Internauka" is an officially registered, ongoing multidisciplinary peer-reviewed scientific periodical with open access (Certificate of Registration: KV No. 22444-12344ПР). International electronic scientific journal "Nauka Online"
International electronic scientific journal "Nauka online" is an officially registered, ongoing multidisciplinary peer-reviewed scientific periodical with open access (Certificate of Registration: KV No. 22285-12185Р). International scientific journal "Internauka". Series: "Economic Sciences" is an officially registered, ongoing, peer-reviewed scientific periodical with open access (Certificate of Registration: KV No. 22443-12343Р). The magazine is included in the list of specialized journals recommended by the Ministry of Education of Ukraine, in accordance with Order No. № 693 of 10.05.2017.
International scientific journal "Internauka". Series: "Juridical Sciences" is an officially registered, ongoing, peer-reviewed scientific periodical with open access (Certificate of Registration: KV No. 22442-12342Р). The magazine is included in the list of specialized journals recommended by the Ministry of Education of Ukraine, in accordance with Order No. № 693 of 10.05.2017. The International Scientific Journal "Internauka" together with the International Scientific Center and with Financial And Economic Scientific Union conducts the International Scientific and Practical Conferences on various fields of sciences. Following the results of each conference the collection of articles is issued, obligatory mailing is carried out and all materials are placed on the website of the Publishing house "Internauka". The Publishing house "Internauka" offers services in imposition, proof-reading and publication of single and collective monographs, as well as teaching aids. All published monographs and manuals are placed in scientometric base and each edition is assigned with a digital identifier DOI. More detailed information is available on the link.